We hear it time and again that our lives are too hectic, and it’s true. So, it takes real strategy to counteract and balance the chill in our lives. I found the Tranquil Moments Bedside Speaker & Sleep Sounds Machine by Brookstone about a year ago and after meditating today I decided that I wanted to share my experience with my beautiful readers. 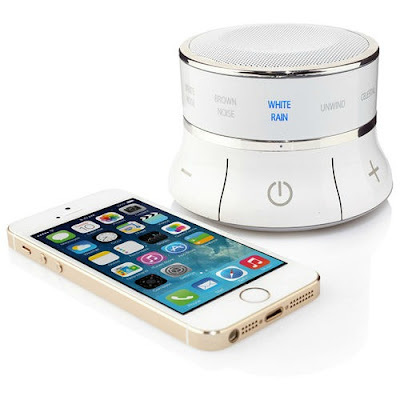 The Tranquil Moments machine is multipurpose, serving as a Bluetooth speaker by day allowing you to “rock out”. At night, the doctor developed sleep sounds allow you to relax, or if you’re like me -- an avid practitioner of meditation -- it helps to bring about a sense of peace and calm. The 12 sound programs are based off of DELTA, ALPHA and THETA brainwave patterns associated with deep states of sleep, relaxation and renewal. The machine features a gradual playback that allows for steady uninterrupted sleep. Check out our review on YouTube and you can find the Tranquil Moments Bedside Speaker and Sleep Sound Machine online at Brookstone. This sleep machine is currently selling for $129, however you can find deals on DealSpotr!